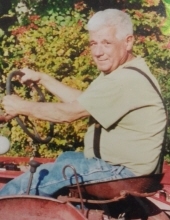 Dennis Winslow McIntyre, 78, of Wilton, NH, passed away on January 17, 2019 in Nashua, NH after a short illness. Denny was born on February 3, 1940 in Randolph VT, the son of Leslie Victor McIntyre and Louise Erma (Curtis) McIntyre. He grew up in Rochester, VT where he attended school with his twin brother, Doug, graduating from Rochester High in 1958. In 1958, Denny married Regina (Jean) Tracy. They moved to Wilton, NH where they raised four children; Debra, Jeff, Tami, and Jodi. Denny worked for Edgecomb Steel in Nashua, NH for 48 years retiring in 2006. He enjoyed hunting, fishing and going for long country drives. Denny is survived by three daughters; Debra McIntyre (Kent Bushaw) of Wilton, NH, Tamara "Tami" (William) Gabor of The Villages, FL, Jodi (William) Kincaid of Milford, NH; one son, Jeffrey (Veronica Sanchez) of Milford, NH; brother Royce "Beaver" McIntyre of Wells River, VT; sister, Marlene McIntyre of Rochester, VT; brother-in law Charles Duval of Amherst, NH; sister-in-law, Nancy McIntyre of Rochester, VT. He is also survived by twelve grandchildren; two great-grandchildren and many nieces, nephews and cousins. Denny was predeceased by his parents; sister, Patricia Duval; brothers, Deane "Chub" McIntyre, Merle "Bub" McIntyre and Douglas McIntyre, his twin who passed away six days earlier. A celebration of life will be at a later date in Rochester, VT.
Memorial contributions may be made to the Town of Wilton Ambulance, PO Box 584, Wilton, NH 03086. "Email Address" would like to share the life celebration of Dennis Winslow McIntyre. Click on the "link" to go to share a favorite memory or leave a condolence message for the family.